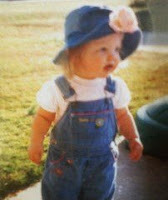 Artist Unplugged: "She Is 16, Going On 17....."
Monday was VolleyGirl's 16th birthday. 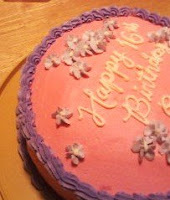 Below is the pink and lavender cake. 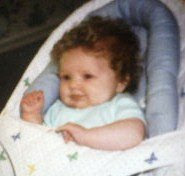 She is only months old in the above photo and her hair does not appear as curly and blonde as it really was. Pink cheeks, red lips (sh, a bit chubby), she looked just like a cherub. 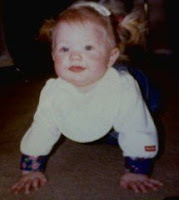 Crawling with pigtails at 9 months old. She was a bit over a year old here. Easter Day and we visited the grandparent's lakehouse for egg hunting when she was 22 months. Ahhhh, one of my favorites - the 2 year old 'pouting angel' at Halloween. Pouting because I wouldn't allow her to open a big decorated cookie at Grandmother's house just before we were to leave. Christmas time and she's 3 1/2 years old. That's our first pet, Teri. By two years old she already had more hair than I ever managed in a lifetime. I do live vicariously through her hair! 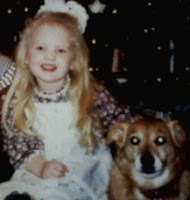 This one didn't come out very clear but it is another favorite photo. 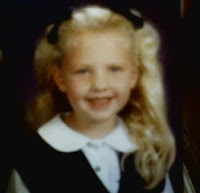 First grade school picture. This one will get me in deep ____! 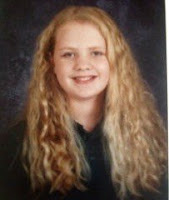 I believe it is 5th or 6th grade. 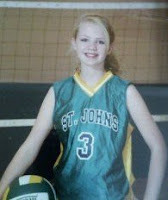 8th grade volleyball photo and she has bangs for the first time. Ahh what a lovely serie of pictures! She is a beautiful person! She is simply adorable. You must be so proud. Happy Birthday, VG! I enjoyed the trip down memory lane- even if it was my first with you! 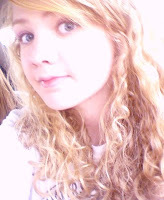 Even though my kids are grown (the youngest will be 20 in 6 months) I can still see the babies they once were. They will always be my babies, I guess.